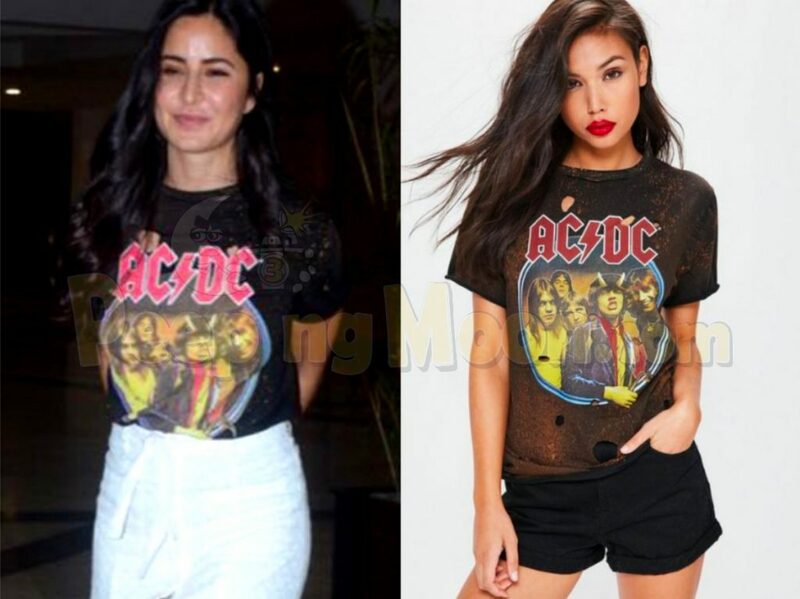 Snapped in Bandra, Bollywood's ab-licious actress, Katrina Kaif was snapped sporting an AC/DC tee. A rock music fan, are you now, Katrina? Well, we love the look. Paired with that sleek-slit skirt was a classier way to go. Katrina was spotted donning the tee by UK based retailer, Misguided and those Steve Madden block heels are love. The top features the graphics of Australian rock band AC/DC. The skirt is a nice-flowy Chikankari skirt. Kat was first spotted in this look with Manish Malhotra and was all smiles for the shutterbugs. She was then snapped outside a restaurant in Bandra, post-dinner with Salman Khan's sister Arpita along with Alvira and Atul Agnihotri. Seems like Arpita and Katrina are good friends, huh! Katrina's next film is to be Thugs of Hindostan. The film also stars Amir Khan, Salman Khan, Amitabh Bachchan and Fatima Sana Shaikh. The film is set to hit the cinemas on 7th November 2018.